In a large heavy saucepan cook the bacon over moderate heat, stirring occasionally until crisp. Transfer bacon, with a slotted spoon to paper towels. Sauté onion in bacon fat until soft, approximately 5 minutes. Add flour and stir for 15 seconds; slowly add chicken stock, quickly stirring with a wooden spoon. Bring to a boil; reduce heat to a simmer and add potatoes. Simmer until potatoes are tender, about 7 to 10 minutes. Add wine; simmer 1 minute. Stir in cheese - at this point, do not boil the soup. 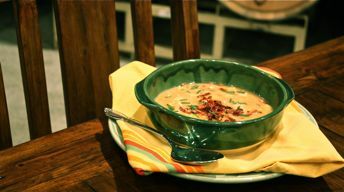 Serve soup sprinkled with reserved bacon & chives.